The Italian Riviera is the coastal strip which lies between the Ligurian Sea and the mountains chain by the Maritime Alps and the Apennines. The Riviera extends from the French border and the French Riviera near Ventimiglia to the Tuscan border and the eastern end of the Gulf of La Spezia (Gulf of Poets). Right in the center is the Italian port town Genoa, which divides the Italian Riviera into two coastlines: the Riviera di Levante and the Riviera di Ponente. The Riviera di Levante is less developed and more naturally beautiful than the Riviera di Ponente. Here you can find small colorful pastel fishing villages hugged by mountains that plunge into the sea, steep green hills and groves of olive and lemons trees as well romantic vineyards. The Italian Riviera is the perfect setting for your wedding on the Mediterranean sea. It busts a vast variety of different beautiful wedding venues and locations for a perfect Riviera wedding in Italy – from elegant castles or rustic restaurants to the most charming Italian gardens with a breathtaking view. The jewel of the Italian Riviera is the sumptuous fishing village of Portofino, east of Genoa. It sits on a rocky promontory, its cluster of ochre and pink buildings backed by hills clad in pines, palms, azaleas and cypresses: A wedding on the Italian Riviera and the noble Portofino and Santa Margherita area stands for style, luxury and class. We also love the charming Gulf of La Spezia with the beautiful small towns Lerici and Portovenere. Couples that desire a more rustic and authentic Italian Riviera wedding we like to recommend a wedding in the Cinque terre area.The Cinque Terre (Five Lands) consist of the villages Monterosso, Vernazza, Riomaggiore, Corniglia and Manarola. The villages, the coastline and the surrounding hills are part of the Cinque Terre National Park and UNESCO WORLD HERITAGE SITE. All of the villages built on sheer cliffs above turquoise waters, these clutches of brightly coloured houses are minor miracles of ancient engineering and building dexterity, with the steep land around stunningly etched into terraces of vineyards and tiny fields. 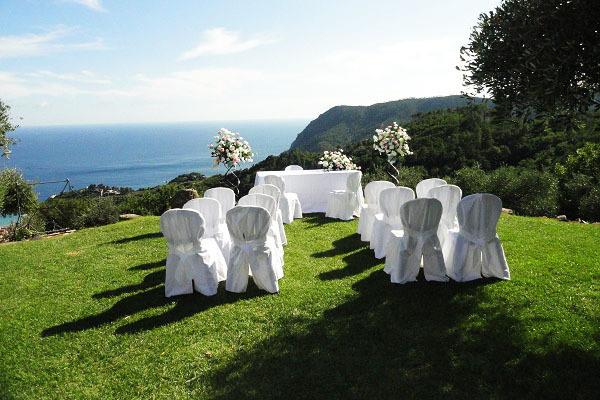 In the Cinque Terre you can find the most enchanting wedding venues with panoramic view over the Mediterranean. A wedding on the Italian Riviera does not have to be expensive and is affordable for every wedding budget. Please contact us for our fine selection of beautiful wedding venues and wedding location for your perfect Riviera wedding in Italy!